Every city seems to have a few intersections that for whatever reason attract a lot of accidents. You’re probably familiar with them in your home town, but it would be nice to know about the potentially dangerous intersections when driving in other areas. Waze is well known for notifying users about traffic jams, accidents, and road work, but now it could potentially save your life as well. The popular notification app will now alert drivers to slow down when approaching intersections that have the greatest incidence of collisions and injuries. This new feature is already active in Boston, Los Angeles, New York City, San Francisco, and Washington, D.C.
Waze is hopeful this new feature will make cities a safer place by lowering the incidence of collisions and injuries. Let’s hope the company will be able to extend the service into more cities in the near future. In addition, Waze announced new celebrity voiceovers for turn-by-turn directions: Stephen Colbert, Ron Gronkowski, and Neil Patrick Harris. In celebration of next week’s The Late Show premier, users can hear Stephen Colbert’s one-of-a-kind navigational commands through September 22nd. Ron Gronkowski, tight end for the New England Patriots, will not only give you voice guidance, he will remind you about Dunkin Donuts locations as well. Finally, Neil Patrick Harris will promote his new show, “Best Time Ever,” as well as provide you with turn guidance. 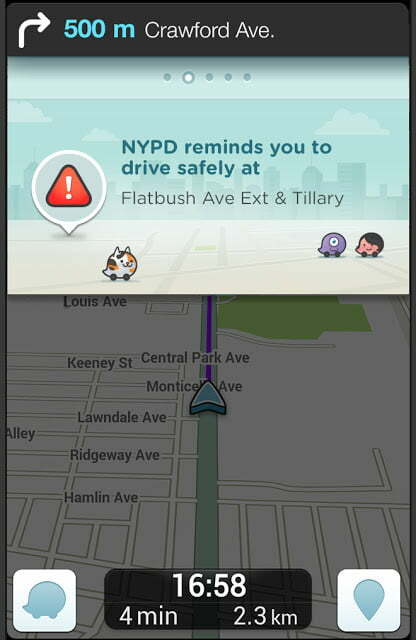 Waze users can install these voice-overs by clicking on Settings, followed by Sound and Voice Language. Then select your preference.